ISLAMABAD, Pakistan (CNN) -- A suicide attack at the offices of the World Food Program in Islamabad killed five employees and wounded several others Monday, an agency official said. 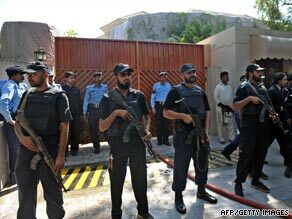 Pakistani police commandos stand in front of a U.N. office after a suicide blast in Islamabad on Monday. Four Pakistanis and an Iraqi national died at the U.N. humanitarian agency, according to authorities. The suicide bomber, who also died in the attack, was in his 20s and wore a vest containing about 15 pounds (7 kg) of explosives, said Ben Yamin, a senior Pakistani police official. The explosion took place in a storage area at the offices. It was not immediately known how the bomber gained access. "The building itself is surrounded by massive blast-proof walls and, not only does the compound have a gated entrance, the street that leads to the compound is also gated." Pakistani Foreign Minister Makhdoom Shah Mahmood Qureshi said public opinion is turning against the attackers. "Today when people see that there are innocent people dying, when they see all the major urban centers of Pakistan being hit, when they see that the economy of Pakistan has suffered, and job creation and investment have been compromised because of these extremists, I think the public opinion has changed," he said in a speech at Rice University's Baker Institute for Public Policy in Houston, Texas. "There is almost a consensus in Pakistan that our immediate priority is to take the terrorists on and to fight this." The neighborhood is home to at least one other U.N. office, as well as the residence of Pakistani President Asif Ali Zardari. Officials identified the dead as Mohammed Wahab, finance assistant; Abid Rehman, senior finance assistant; Gulrukh Tahir, receptionist; Farzana Barkat, office assistant; and Iraqi national Botan Ahmed Ali Al-Hayawi, information and communication technology officer.